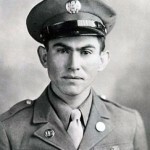 Medal of Honor nominee Pedro Cano was born in La Morita, Mexico, June 19, 1920. He joined the U.S. Army in 1944, during World War II. Cano is being recognized for his valorous actions in the months-long battle of Hurtgen Forest. He was advancing with his company near Schevenhütte, Germany, in December 1944, when the unit met heavy enemy resistance. During a two-day period, Cano eliminated nearly 30 enemy troops. Sometime later, while on patrol, Cano and his platoon were surprised by German soldiers that caused numerous casualties within their platoon. Cano lay motionless on the ground until the assailants closed in, then tossed a grenade into their midst, wounding or killing all of them. It was in this engagement, or shortly thereafter, that Cano sustained serious injuries. He was returned to the States and placed in a Veterans hospital in Waco, Texas. After which, he returned home to his wife and daughter in Edinburg. Cano would pass away six years later. Posthumously, Cano received the Texas Legislature Medal of Honor. A school in Edinburg, Texas is named after Cano. In addition to the Medal of Honor, Cano received the Distinguished Service Cross (this award will be upgraded to the Medal of Honor on Mar. 18), Bronze Star Medal, Purple Heart, Army Good Conduct Medal, European-African-Middle Eastern Campaign Medal with one Silver Service Star and Bronze Arrowhead, World War II Victory Medal, Army of Occupations Medal with Germany Clasp, Presidential Unit Citations, Belgian Fourragere, Combat Infantryman Badge and the Honorable Service Lapel Button-World War II. The President of the United States of America, authorized by Act of Congress, July 9, 1918, takes pleasure in presenting the Distinguished Service Cross to Pvt. Pedro Cano, United States Army, for extraordinary heroism in connection with military operations against an armed enemy, while serving with Company C, 8th Infantry Regiment, 4th Infantry Division, in action against enemy forces in Germany, Dec. 2, 1944. On that date, the infantry company with which Cano was advancing near Schevenhutte, Germany, was halted by intense enemy machine-gun fire. Armed with a rocket launcher, Cano crawled through a heavily-mined area, under a hail of fire, and reached a point within ten yards of the nearest emplacement. He fired a rocket into the position, killing the two gunners and five supporting riflemen; fired into a second position killing two more gunners; and with hand grenades killed several and dispersed other protecting riflemen. Then, when an adjacent company encountered heavy fire, Cano crossed his company front, crept to within fifteen yards of the nearest enemy emplacement, and killed the two machine-gunners with a rocket. With another round he killed two more gunners and destroyed a second gun. On the following day when his company renewed the attack and again encountered heavy machine-gun fire, Cano, armed with his rocket launcher, again went forward over fire-swept terrain and destroyed three enemy machine-guns in succession, killing the six gunners. His daring actions, without thought of his own safety, permitted the advance of his company. Cano’s conspicuous heroism, and his fearless determination and courageous devotion to duty, exemplify the highest traditions of the military forces of the United States and reflect great credit upon himself, the 4th Infantry Division, and the United States Army. Cano is set to receive the Medal of Honor posthumously in a ceremony at the White House on March 18.